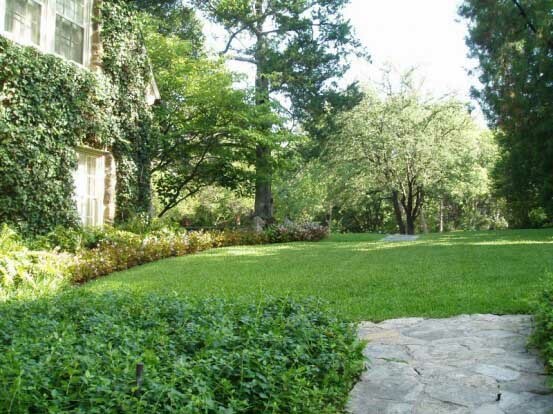 Healthy soil with balanced nutrients will grow the most beautiful lawn. In Part One of Understanding Plant Nutrients we learned how the lack of Nitrogen, Phosphorus, and Potassium influence plant growth. In today’s post, we explain how secondary and trace minerals play a role in many other functions within your lawn grasses. Iron, Manganese, and Calcium are common secondary or trace mineral deficiencies we see often in our climate and soils. How do you know if your plant needs one of these nutrients? Read on to find out! Without chlorophyll, your plants can’t photosynthesize sunlight to make the energy they need. Plants need Iron to make chlorophyll. While an Iron deficiency in the soil is uncommon, plants have a hard time absorbing it if the soil pH is higher than 6.5, which is the case in most of our DFW soils. High levels of other nutrients, such as Phosphorus, can also bind up available Iron. When your lawn or landscape plants can’t absorb enough Iron, you’ll typically see “interveinal chlorosis” ,or a yellowing between the leaf veins. Solutions: Adding compost into the soil is a great way to make Iron more available to your plants. Improving compacted soil will also increase the availability to your plants. Garden sulfur, natural Iron supplements and organic soil conditions can help re-green your plants. How well do you know your soil? Find out HERE. The foliage on my plants is turning yellow between the veins…but adding Iron isn’t helping. Your plants could be deficient in the trace mineral Manganese; Iron deficiencies and Manganese deficiencies are often confused. It is most common in soils that drain poorly and contain a lot of organic matter. A high soil pH can also cause this deficiency. Manganese is important as it assists with photosynthesis and nutrient absorption, especially Nitrogen, and respiration. Initially, a Manganese deficiency will look similar to an Iron deficiency. As the deficiency progresses white or tan blotches will appear between the veins of the leaves. It creates a checkered appearance. Solution: Foliar feed your plants with liquid fertilizer that containers Manganese (Mn). Organic soil conditioners will also help break down excess organic matter and improve drainage. My plant’s leaves are curling and turning brown. Plus, my tomatoes are rotting! Your plants could be suffering from a Calcium deficiency. Calcium is responsible for cell elongation and growth, how our plants manage heat stress, assists in taking up other nutrients, and most importantly, affects fruit production. Inconsistent water and slow transpiration greatly impact the level of Calcium taken up by plants. Symptoms of a Calcium deficiency include the appearance of brown and yellow spots throughout plant leaves, leaf curl, stunted growth, and possibly death. Calcium deficiencies in your edibles such as tomatoes, melons, peppers and strawberries, cause the fruit to have blossom end rot. A sunken and rotten spot will appear on the bottom (or end) of the fruit. Solution: Manage soil moisture consistently; Calcium is water mobile and Calcium sensitive plants can become deficient if the soil drys out often between watering. Don’t over-fertilize with Nitrogen; too much Nitrogen can inhibit Calcium absorption. Don’t plant acid-loving plants in our high pH soils! No time to manage your plant health or find yourself? Or, do you feel you are wasting time and money feeding plants with no positive affect? As part of our organic Soil Building program, we’ll automatically add the right nutrients at the right time to mitigate many soil deficiencies that harm plants and decrease their vigor.